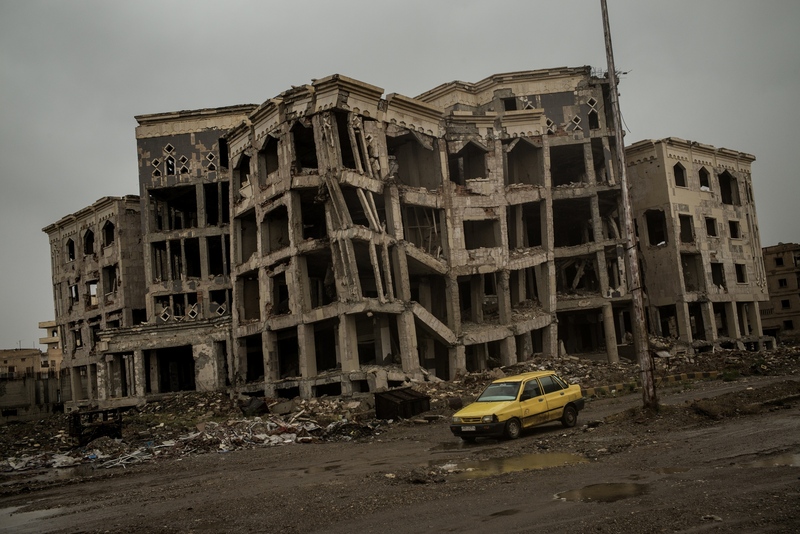 Seven months after ISIS was ousted from their capital, civilians are returning to rebuild their lives and homes. Without a visible presence of NGOs or strong support from the coalition because of ongoing security concerns, the city’s residents and civil council and municipality have taken it upon themselves to clean up the rubble and reopen stores in time for Ramadan. An estimated half of the 400,000 civilians - the number of people who were in the city before coalition airstrikes began last June — have returned to a city devastated by airstrikes, street battles, and unexploded ordinance, including mines and booby traps left behind by the extremist militias. Infrastructure like bridges connecting the northern and southern parts of the city have been destroyed, forcing people to use flimsy barges to transport their vehicles, crops, and other goods to the city center. Late rains this year have also compounded the city’s woes as it relies heavily on agriculture. Bodies also remain under the rubble, worsening fears that disease could easily break out as the weather becomes warmer. Civilians use barges to transport their cars, crops, and other goods across the Euphrates River as seen in Raqqa, Syria, on Thursday, June 28, 2018. Many of the main bridges in the center of Raqqa that previously connected the northern and southern halves of the city were destroyed in coalition airstrikes. Eight months after ISIS was ousted from their capital, civilians are returning to rebuild their lives and homes. Without a visible presence of NGOs or strong support from the coalition because of ongoing security concerns, the city’s residents and civil council and municipality have taken it upon themselves to clean up the rubble and reopen stores in time for Ramadan. An estimated half of the 400,000 civilians - the number of people who were in the city before coalition airstrikes began last June — have returned to a city devastated by airstrikes, street battles, and unexploded ordinance, including mines and booby traps left behind by the extremist militias. Infrastructure like bridges connecting the northern and southern parts of the city have been destroyed, forcing people to use flimsy barges to transport their vehicles, crops, and other goods to the city center. Late rains this year have also compounded the city’s woes as it relies heavily on agriculture. Bodies also remain under the rubble, worsening fears that disease could easily break out as the weather becomes warmer. 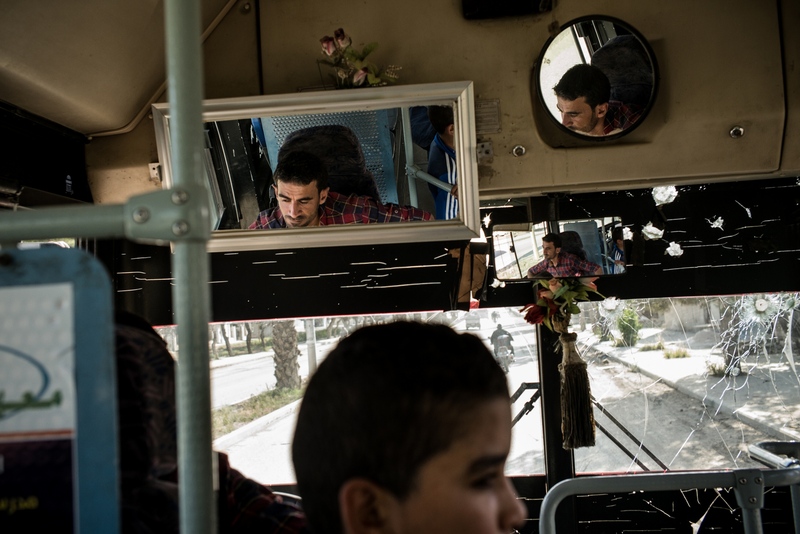 A bus driver is reflected in the mirrors in Raqqa, Syria, on Thursday May 10, 2018. Public buses in Raqqa, which are damaged by bullet holes, have began running again on one route - although only in a very small capacity - to help service the civilian population. 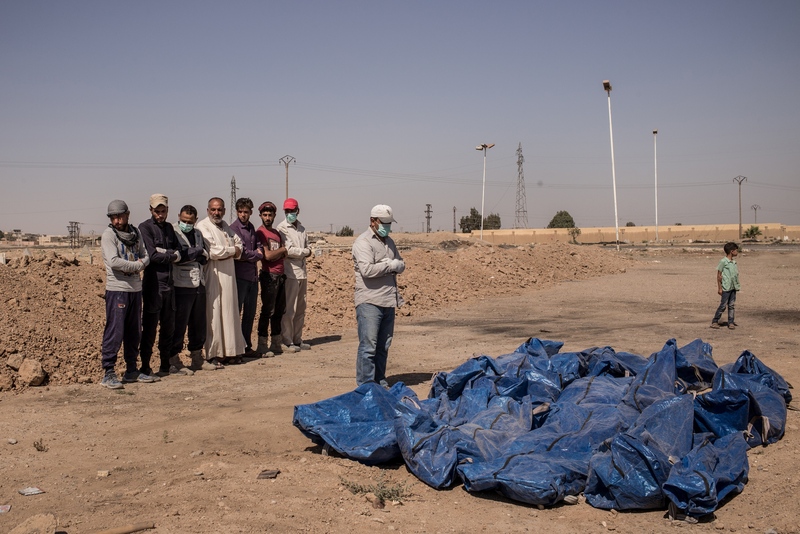 Members of the Raqqa Civil Defense pray before at least 15 bodies and remains of people they retrieved from a mass grave, before reburying them in a cemetery further away from the city center, as seen in Raqqa, Syria, on Saturday, June 30, 2018. Most of the bodies found at this particular location were likely to have been civilians killed in coalition airstrikes. 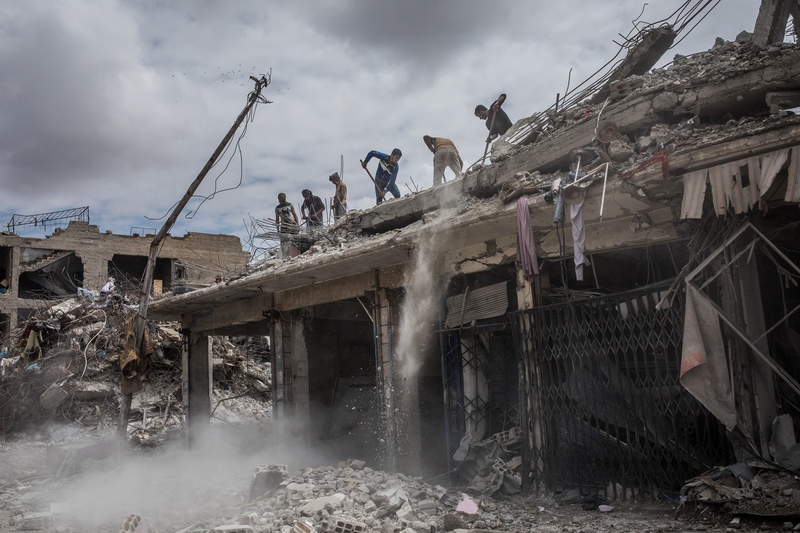 Construction workers remove rubble from a destroyed building in Raqqa, Syria, on Wednesday, May 9, 2018. An estimated 80 percent of Raqqa's infrastructure was destroyed or damaged during the offensive to retake the city from ISIS, with thousands of lives lost in aitstrikes by the coalition, addition to those civilians who were executed by ISIS during their reign over the city from 2014 until their ouster in 2017. Young boys swim and play in a fountain in a park in Raqqa, Syria, on Friday, May 11, 2018. Public parks in Raqqa were used as impromptu burial sites for those killed in executions carried out by ISIS during their reign, or airstrikes by the coalition during the offensive to oust the extremist group from the capital of their so-called caliphate. Many parks still contain the remains of hundreds of people, as well as unexploded ordinance. But as life comes back to this eastern Syrian city, rather than be deterred, civilians are eager to have some semblance of normal life and enjoy their freedom outdoors. 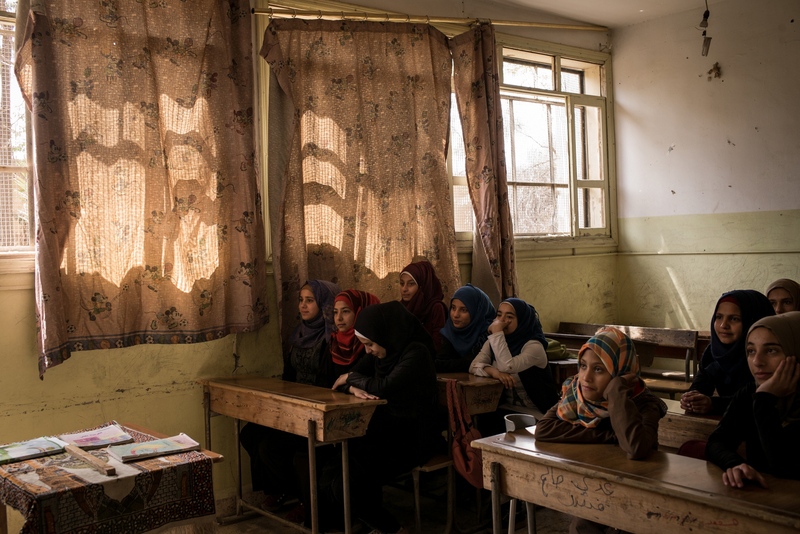 Female students are seen in class at the heavily damaged Hawari Bu Medyan School, in Raqqa, Syria, on Thursday, May 10, 2018. The school is located opposite a building that was used by ISIS's religious police, the Hisba, and was also the site of intense fighting during the offensive to retake the city from the extremist group. The school reopened in January 2018. 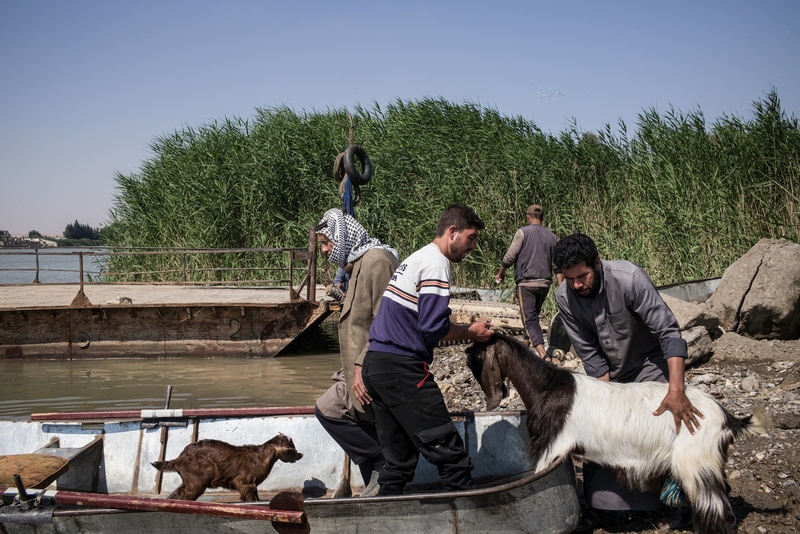 Men load livestock onto a small boat on the north bank of the Euphrates River in Raqqa, Syria, on Monday, May 14, 2018. 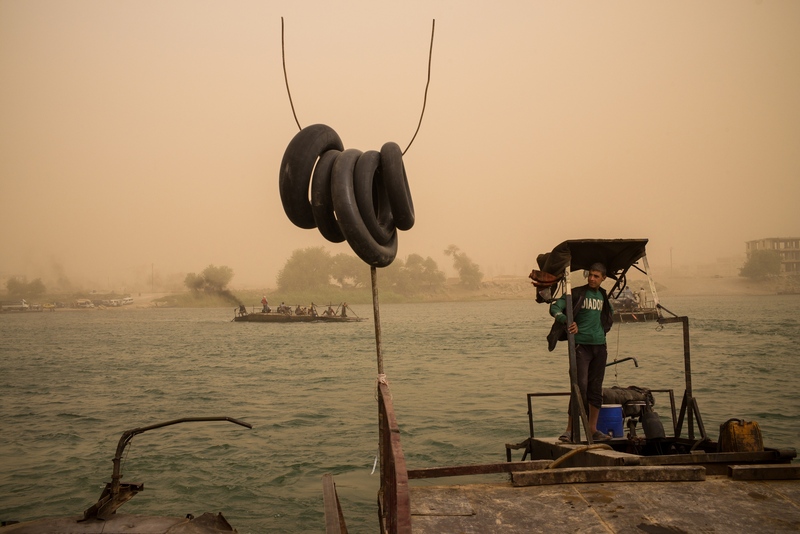 The destruction of vital infrastructure in the city has forced civilians to use flimsy barges and boats to cross the Euphrates River that divides the northern and southern parts of the city to trade their livestock and crops. Some barges have sunk in recent months, killing at least half a dozen people. As the former capital of ISIS's so-called caliphate, Raqqa is struggling to get back on its feet - free from the Assad regime and ISIS - through an alliance of Kurdish and Arab representatives and its military wing (the Syrian Democratic Forces) and with little assistance from NGOs and foreign donors. 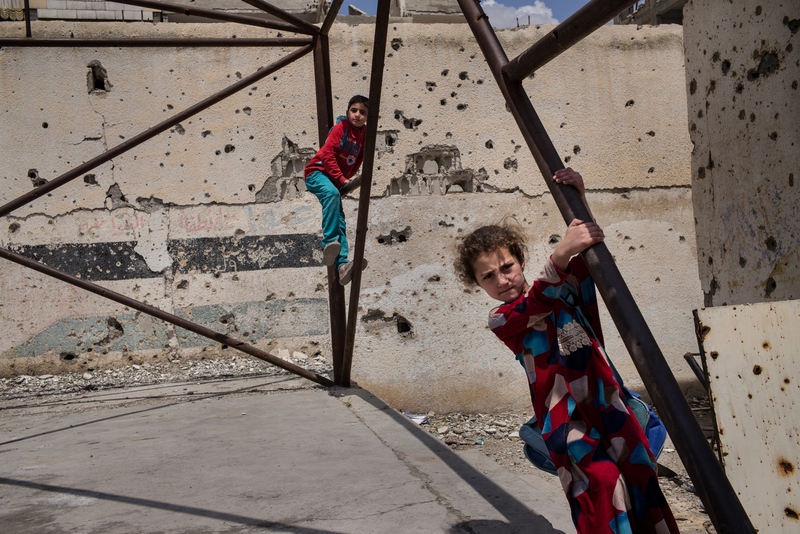 Children play in the courtyard at the heavily damaged Hawari Bu Medyan School, in Raqqa, Syria, on Thursday, May 10, 2018. The school is located opposite a building that was used by ISIS's religious police, the Hisba, and was also the site of intense fighting during the offensive to retake the city from the extremist group. The school reopened in January 2018. 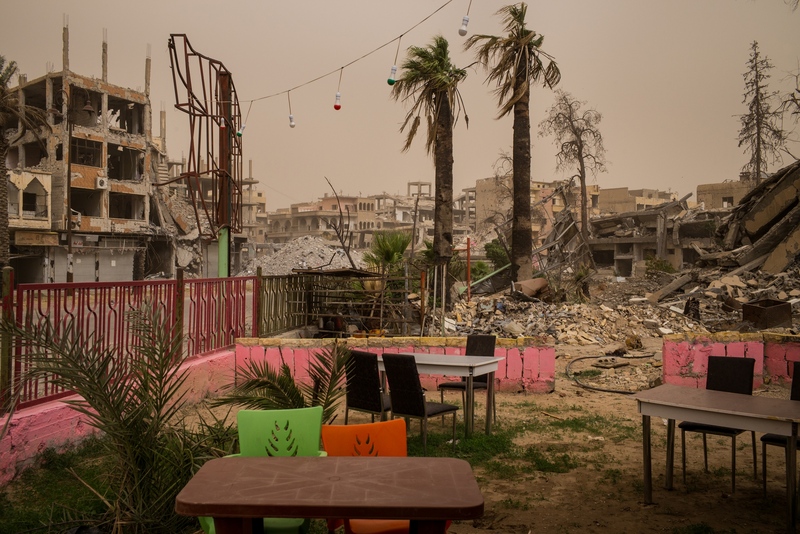 A newly opened cafe stands in contrast to the backdrop of a destroyed city in Naim Square, Raqqa, Syria, on Thursday, June 28, 2018. Naim Square was a hub of social life before it became a symbol of ISIS's brutality, where the extremist group would carry out public executions.